Wales is blessed with a spectacular coastline. 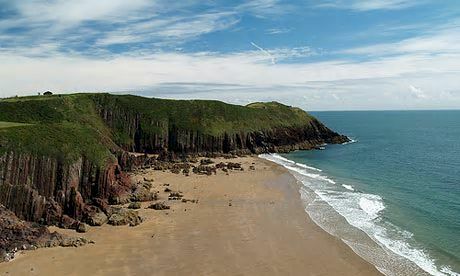 In among its famous stretches of sand are some lovely hidden coves and bays. 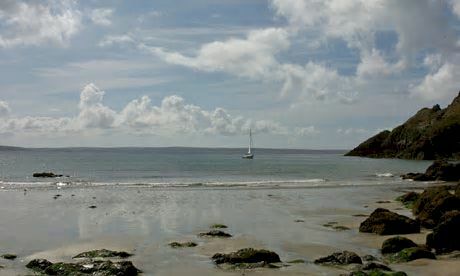 Rob Smith, author of Secret Beaches Wales, picks 10 of the most secluded, and where to eat nearby. Presipe, about 20 minutes' walk from Manorbier, is a true gem. Huge crags of fossil-rich red rock jut forth towards the sea to form private coves and slips of sand. 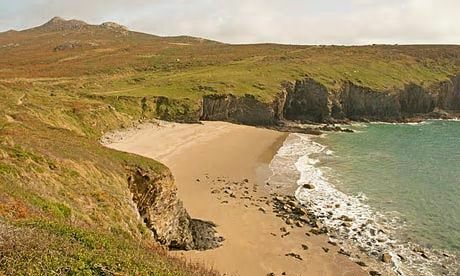 This bay is secluded, you are unlikely to find it touched by any footprints other than your own. The pit stop: The Castle Inn, Manorbier, Tenby A mix of surfers, families and locals of all ages makes this cosy little pub buzz with life most days of the week. Try the blanchbait, a plumper alternative to whitebait, deep fried and served with a chunk of bread and salad. Or tuck into a hearty and wholesome curry of Welsh Blackbeef, lamb or vegetables. Getting there: Drive south out of Tenby on the A4139. Drive through Penally and Lydstep. One kilometre after Lydstep, turn left on to the B4585 and follow all the way to Manorbier. From the village, follow signs to the beach and park in the beach car park. The small waterfall at the back of this little sandy bay streams on to the sand among shards of purple slate: it's a lovely, quiet place to unwind. 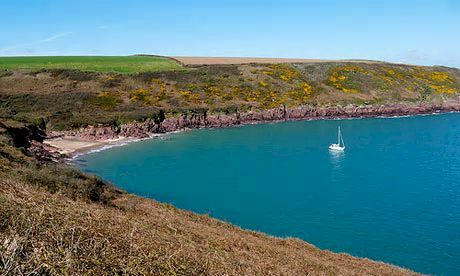 The impressive views take in West Angle Bay, Rat Island and the whole length of Milford Haven and Man of War Roads, a 15km ship-teeming passage leading from Dale all the way to Pembroke Dock. The pit stop: Griffin Inn, Dale, Haverfordwest The owners of this waterside pub, Sian and Simon, are incredibly welcoming hosts who pride themselves on their home-grown ingredients and serve some excellent local cask ales. It's an idyllic spot in summer, and also in winter – thanks to warm stoves and open fires. Getting there: From Haverfordwest, drive southwest on the B4327, which will take you all the way to Dale. Park in the main car park on the right when you reach the beach. 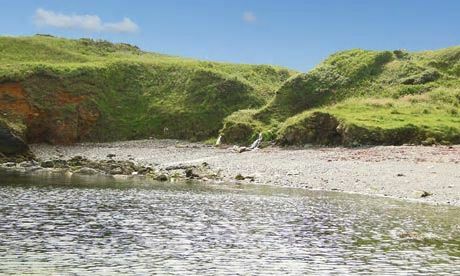 Surrounded by a lush green valley, this little bay between Solva and Newgale is a must for swimmers. Part of the wider expanse of St Brides Bay, Porthmynawyd is well protected from the slicing currents that run between the mainland and nearby Ramsey Island. Swim through clear channels or explore countless hidden caves filled with fluorescent blue water. After mid-tide, the bay reveals some large patches of soft, wet sand, perfect for building castles and moats, if visiting with children. The pit stop: The Old Pharmacy, Solva In the past, the owners have raised three of their own pigs for use in the restaurant and their intention is to breed chickens and cattle as well. The lobster comes from pots just offshore near the Solva estuary and all the seasonal vegetables are grown on the farms around St Davids. Start with a Solva harbour crab pot, followed with a grilled organic Welsh Black sirloin and rounded off with a selection of Welsh cheeses. Getting there: Drive north out of Newgale on the A487. After about three kilometres, you pass a turn for Pointz Castle Farm on your left. Park in the lay-by just past the turning, again on your left. The pit stop: Cwtch, St Davids This fantastic little restaurant has stolen the hearts of the foodies in St Davids and it has the awards to prove it. The lunchtime line-up includes pork hock terrine with apricot and pistachio, and come evening there's 21-day matured, 8oz sirloin with triple-cooked chips or pan-fried Solva sea bass with sauce vierge. It can get busy, so you'll need to book in high season. Getting there: Briefly follow the A487 heading northeast out of St Davids, then join the B4583 to Whitesands Bay.Follow the signs to Whitesands Bay all the way to the beach and car park. 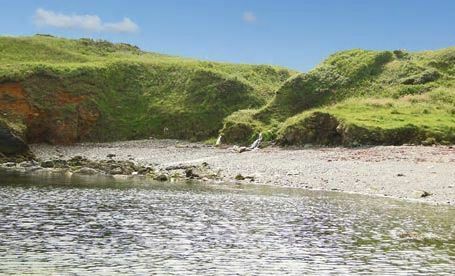 A 10-minute drive from Fishguard and a 20-minute stroll from the impressive Strumble Head will bring you to this quiet cove, which is perfect for a family day out and a genuine refuge from the summer crowds. Swimming can be enjoyed without the fear of strong currents or large swells, and you can spot seals enjoying the bay too. Backed by low headlands and no less than three waterfalls, it is easy to linger at Porthsychan for as long as the sun allows. The pit stop: Links Golf Club Restaurant and Bar, Newport Commanding views over Newport Bay and a menu of local dishes draw in a crowd of regulars. Try the wild venison loin or Jerusalem artichoke risotto. In the evening, sunlight bounces off the sheer cliffs on the opposite side of the bay and streams into the dining room. Getting there: From Fishguard, drive down to Goodwick and after you pass the harbour, at the roundabout, drive up the hill following the signs for Strumble Head. It's a steep 10-minute route to Strumble Head Lighthouse car park. This is a real smuggler's cove, with two islands to clamber on and numerous hollows along the cliff. One of these, deeper than the rest, has a steady flow of water tumbling from its cavernous roof, seemingly designed for those wishing to rinse themselves of salt and sand. The beach is only 15 minutes' walk from the car park, although the option of a longer return route takes you back through wooded valleys, along riverside pathways and past ferocious waterfalls. The pit stop: The Crown Inn, Llwyndafydd Built in 1799,The Crown Inn is a former Welsh longhouse, with old stone walls and wood-burning stoves. On Sundays there is a carvery, and on a summer's afternoon the pretty garden comes into its own, boasting plenty of tables and a children's play area. Getting there: Travelling north-east out of Cardigan,on the A487, in Plwmp, about five kilometres before the turning to New Quay, take the left next to the post office. This will lead you to the village of Llwyndafydd. Entering the village, just before the pub car park, turn left on to a small lane. Follow this all the way to Cwmtydu.